Add some excitement to your trade show booth or night time event. Our LED Glowing Arcade Crane Machine Rental will draw a crowd at this all time classic game. 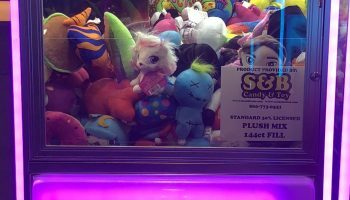 We can fill the LED Glowing Arcade Crane Machine Rental with our plush (stuffed animals). Or if you have some promotional items that you want your guests to try to win we can help out with that. The glowing neon lights that change colors randomly will attract people to your trade show booth and entice them to give it a go. We can set the LED Glowing Arcade Crane Machine Rental on free play (no money required or if you would like this place in your business or resort we can do a revenue split. Watch the video to see how much our games glow! The LED Glowing Arcade Crane Machine Rental is a perfect addition to add to your game room/arcade theme event. Call our office and have us create that Dave & Busters type party for you. We deliver all our game rentals in Northern California, San Francisco, San Jose, Santa Cruz, San Mateo, San Bruno, Moscone Center, Santa Clara Convention Center, San Jose Event Center, East Bay Oakland, and all over the Monterey Peninsula.